Now me, being me, turned and welcomed him and told him I would talk to him in a moment after the class. We finished our class and I asked if the man was still with us. She asked him a question. In response, the man put his hand over his throat. For 15 minutes, I began pulling cards, learning of his story. What follows is that which my Guides have allowed me to state. I am to use the details of what happened only when teaching psychopomp or Death Walking, which is part of my practice. Therefore, I shall not go into much depth here. My student and I discovered that this man (a kind hearted fellow) had been attached to this particular property for many years. He was guarding the space and was unhappy with all the advancement, traffic and noise that had ruined what he had once called home. When I asked what kept him there, the card I pulled (Queen of Cups augmented by the Ten of Cups) indicated it was for the Love of a Woman (his wife I later discovered). When I asked what happened, I drew the Tower. I must explain something–I do not read reversed cards, Instead, I read Elemental Dignities…something far more complex and advanced. When I drew this Tower card, it was reversed in my deck. I then pulled another card–in this case, I pulled Card 13, Death. When asked what happened to his wife, this appeared. Just before, was the Tower, which was reversed. I have no reversed cards in my deck…. I have a technique for doing Yes/No questions in Tarot. According to the Spirit, his wife was under the house. I asked if he wanted to leave here and go into The Light. The cards indicated she was held there and was frightened to leave. “It is alright my friend. I shall help you.” I felt the compulsion to pull a card; I heard the vibration of his question. I drew the High Priestess. “Yes. I know how to do this. 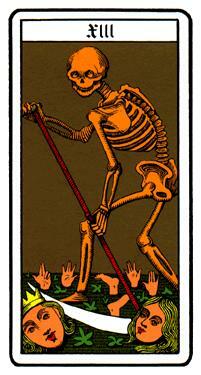 I can help.” After a pause, I pulled another card: it was The Ace of Cups. I looked at my student. Off her look I said, “He’s very grateful.” She wiped away her tears and smiled. The following day, I prepared myself for the psychopomp journey. My Guides will allow me to say this much: I found the Man. When asked about his wife, he lead me to a petite skeleton that lay in the dirt. I explained to him that it was her remains and that she was waiting for him. I checked in with him to ensure he had no soul loss (he was fine) and then I escorted him into the Light. Why I write of this at all is because I knew, a week earlier that I would be doing this type of journey. (I’ve done this many times before). Within this week, an Aunt passed away and then a few days later, this encounter. Part of Shamanic Practice brings one into the elevation of personal awareness. Happily, I pay close attention to this “Felt Sense” and have, over the years, come to realize the validity of those sensations and visions. I live with gratitude for the gift of Life and for my Shamanic Practice. We all have these abilities in various degrees–they are usually weaned by social pressure/family upbringing and such as we are children. Fortunately, I still have mine and have learned to trust them. This however, is an article for future discussion. Please feel free to write if you have any questions or are in grief over the loss of a Loved one that has/is impacting your Life for an excessively long time.